Meet Wandering Laur. Her jewellery consists of unloved vintage beads and old jewellery which has been rejuvinated with a more stylish touch, and look far better than the originals ever could have. Her shop has a gorgeous mix of pastel colours and darker, antiqued tones, and a large selection of each! I see many shops with similar jewellery, but something about this shop just makes it stand out to me. 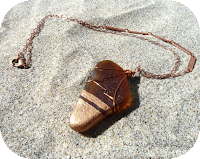 Seaglass is also becoming popular lately, and I've seen some fair pieces, but [name]'s take on it is a little more unique. She combines the soft, gentle tones of the washed up seaglass with far, far bolder paints, but only a small amount. The contrast between the two gives each end a great impact - the glass seems lighter, and the paint seems brighter. It's truly an original take, and I've seen no one else do it. 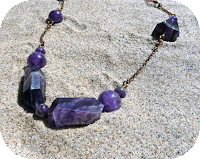 I'm not usually fond of beads, or of necklaces which consist mostly of them, but some pieces in Wandering Laur really jump out at me! 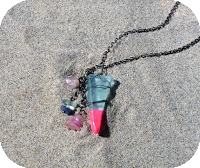 Like the pastel beaded necklace pictured below, and particularly the brown seaglass. The bronze paint still stands out but it has a calmer, if much more obvious look than the bright colours. But each piece in her shop really stands apart from the others, which makes browsing far more interesting - though can keep shopping difficult! Your jewellery is unique and wonderful. Where do you get your inspiration? Thanks! I get my inspiration from all over - the streets of New York City (where I live), the beach where I grew up, places I’ve traveled and people I’ve met, glimpses of nature, saturated color, and especially vintage jewelry. I also get a lot of inspiration from my materials themselves, since I use mostly antique beads, vintage chains, and found sea glass. It’s so much fun to take bits of vintage chains and antique unloved beads that I’ve discovered hidden away at an antique fair, and put them together in original ways. I love to create something a little nostalgic, with a modern twist. Each of your pieces are quite unique from one another - some are pastel and others are far darker with antique and earthy colouring. Which do you personally prefer? Sometimes it depends on my mood – I like the long, simple necklaces when I’m looking for something light and fun, but a most of the time my favorite pieces are the big jumbles, no matter what the color. 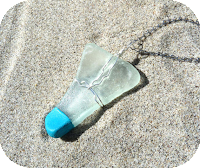 And of course, I adore the seaglass. I try not to ever make anything I wouldn’t wear myself! Your seaglass pieces are so unique! Where did you get the idea to add the bright paint? 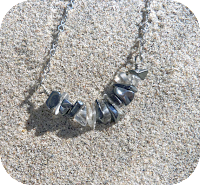 The original ideal came when I saw someone wearing a piece of rough coral as a pendant. I got a flash of inspiration which just kept going – “that coral looks fun as a pendant, but it would feel rough against my neck and clothes. 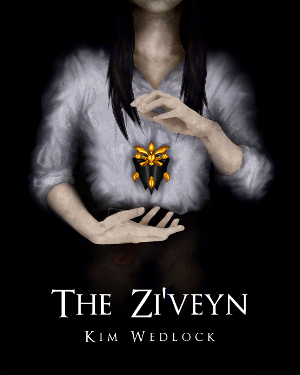 Wow, you know what would make an awesome necklace? 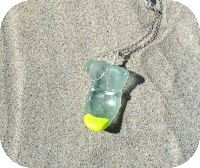 Seaglass! You know what would make it even cooler? Painting it in fun colors!” From there I couldn’t get the idea out of my head and immediately set out figuring out how to make it a reality. I grew up on the beach, in Rockaway Beach, New York, and my family has been collecting seaglass for years when we walk along the shore, even though we’ve never done anything with it. Now I’ve raided the jars we’ve been saving for an inspiration just like this, and put it to good use… I’ve never seen anything like my pendants, so it seems like I’ve created something pretty special. I’m really excited about them. Do you have any plans for future pieces, or do you find your inspiration will only come to you when it wants to? I’m always thinking of new ideas. 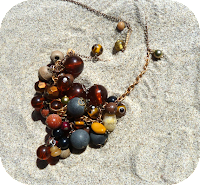 Sometimes I have trouble falling asleep because visions of necklace ideas are dancing in my head – seriously! Just looking at my materials gives me lots of inspiration. The only thing stopping me from creating more is the amount of time in any given day. The act of creating is always pushing me in new directions with my jewelry-making, and that process of discovery is a lot of fun. 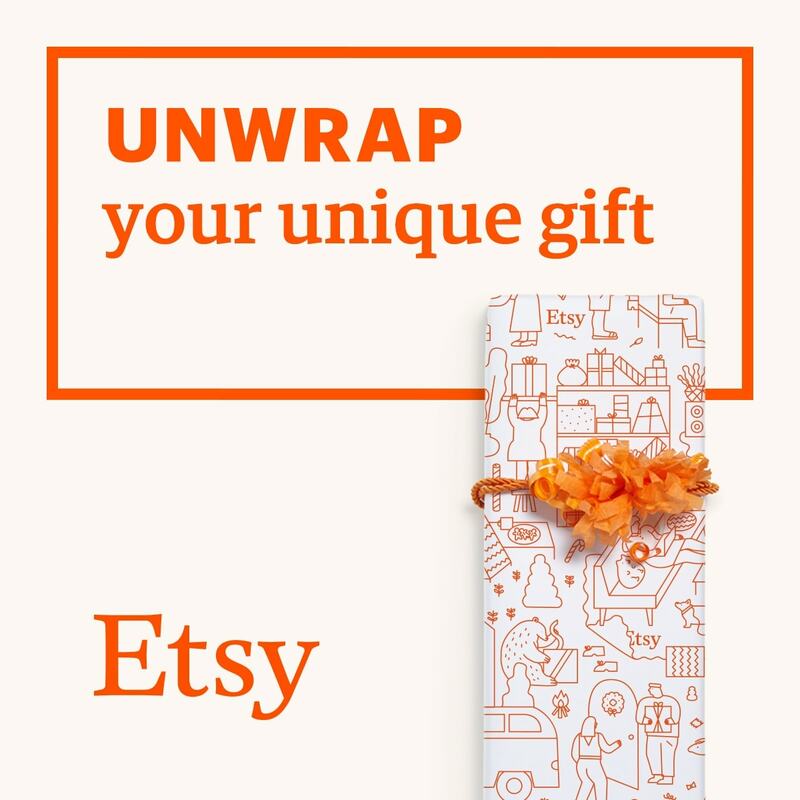 What made you initially join Etsy? I’ve used Etsy for years as a shopper. When I started making jewelry, soon I had more than I could ever possibly wear. I was getting lots of compliments on it, so I thought, why not sell it? Etsy is so user-friendly and has such a wonderful community of sellers, it was a logical step. When shopping on Etsy, is it mostly the jewellery sections you search, or do you find yourself frequently wandering into the paper goods or clothing sections? I shop all over on Etsy! There are so many wonderful things out there – it never ceases to amaze me how incredibly creative people are. I got an iPhone charger that looks like an old book – it’s so much fun. I’ve even purchased some supplies from Etsy (a few great vintage chains). I’m definitely a browser. Just this week, I bought a beautiful laptop sleeve. I’ve also bought vintage – I got a great Coach purse from the 1980s last month. What's your favourite item you've bought from Etsy? It’s hard to choose – but I’ll say probably a bronze bracelet that looks like a raven’s claw that I’ve worn consistently for years and still adore. I also bought a Pendleton bag for my mother that she really likes, in lovely, natural colors. Coffee! I live above an amazing coffee shop that makes the best latte in the world. I couldn’t live (or create) without it.